A data logger is an instrument that is attached to one or more sensory inputs to collect experiment data as an electronic value, enabling analysts to monitor and control process conditions with good degrees of precision and to assess collated data sets. Internal or external sensors may be used to acquire the necessary information depending upon the component’s application. Thermal monitoring, for example, requires data loggers to be attached to external thermocouples that obtain the temperature of a process or component chamber over time and store those values as distinct data points. Thermal data loggers are used to autonomously measure the temperature values of an experiment, process, or component at multiple points over a pre-determined period. Visual displays are used to represent this data in real-time while acquisition software collects valuable data points continuously or at defined intervals. This information can then be exported and analyzed to optimize the storage conditions of temperature-sensitive products such as fast-moving consumer goods. Data loggers are routinely used to monitor the reactiveness of products to temperature and humidity, to predict their behavior in transport conditions. The temperature range, measurement capacity, and degrees of accuracy are three of the most important parameters for data loggers used to collect dynamic thermal information over time. 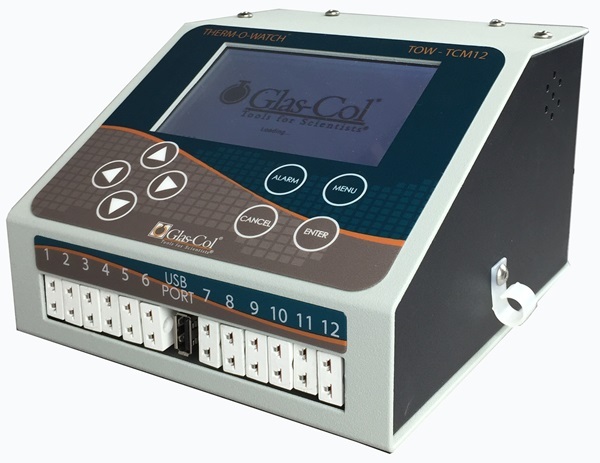 Glas-Col’s desktop data logger is a robust instrument with a full-color liquid crystal display (LCD) that presents continuous data from up to 12 sensory inputs simultaneously. It is equipped with outstanding data acquisition (DAQ) software that can provide information for internal storage and real-time visual display. This user-friendly display allows analysts to easily view the readings for select thermocouples in context, and to establish channel-specific alarm points for set high and low temperature points. Type J, K, and T thermocouples are supported by the 12-channel data logger, with potential temperature readings ranging from -200°C – 1372°C (-328°F – 2502°F). Alarm points can be set to within +/-0.1° C for maximum monitoring accuracy. Collected data points are automatically stored within the device memory. This tabular information can be exported as comma-separated value (CVS) formats, allowing analysts to evaluate the thermal information and inform the optimal conditions for increased product stability and improved yield. At Glas-Col, we are committed to providing the most accurate data acquisition instrumentation for leading-edge laboratory applications. Our history of supplying advanced thermal processing equipment spans back to the early 20th Century, and we remain focused on that goal of providing new and improved instrumentation for heat treatment processes and scientific thermal monitoring. Our 12-channel data logger records and reports multiple points of data simultaneously, with a legible display for ease of usability. If you would like any more information about our data acquisition and monitoring systems, please do not hesitate to contact us.